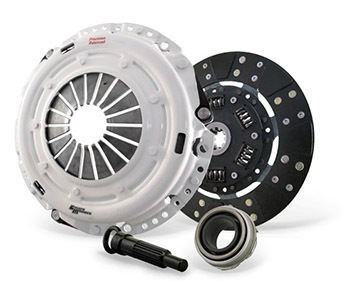 Clutch Masters offers premium clutches and Flywheels for just about every BMW application, off the shelf as well as custom options. Please read below for the different Clutch Type levels and what they are used for. This System uses the Power Plus I Pressure Plate with a custom heavy-duty Steel Back Organic friction disc. This clutch is engineered for heavy-duty street use. It is specifically designed for extended wear and additional clamping force for the enthusiast who has added an exhaust system, an intake system, up to 50hp NO2 upgrade, or other non-forced induction external bolt-ons. It features only slightly increased pedal pressure, longer life than stock, and normal clutch feel during engagement and disengagement for a very smooth operation. The FX200 System uses the Power Plus I Pressure Plate and a Steel Backed Kevlar disc. This clutch is designed for the street enthusiast or weekend racer. The FX200 offers similar torque rating and holding capacity as the FX100, however, its life expectancy is increased with the Kevlar disc. Our Kevlar friction material is non-abrasive and doesn't score the mating surfaces. It features only slightly increased pedal pressure, significantly longer life than stock, and normal clutch feel during engagement and disengagement for the smoothest operation of any stage we offer. Minimum 500 Required break in miles. Please see The Technical guide for more details. This System uses the Power Plus I Pressure Plate and a hybrid combination of Clutch Masters New Formula Button on one side and a heavy-duty Steel Back Organic friction lining on the other. This clutch is designed for the street enthusiast or weekend racer who plans to abuse their vehicle on an occasional basis and have a spirited driving style. The FX250 clutch system has a higher holding capacity than a traditional full faced Kevlar without compromising the street friendly characteristics Clutch Masters is known for. The FX400 System uses the Power Plus I Pressure Plate with a custom, extremely durable, Sprung Ceramic disc. This is the ultimate extreme duty street and/or road/drag racing system. It is available in a 4,6 or 8* wing (paddle) configuration, with the 4-wing being the more aggressive setup and 8-wing being the less aggressive (please specify which type you prefer). The sprung hub design allows for moderate dampening in high-torque applications, rendering it much more street friendly than solid or rigid designs. This disc is designed for outstanding holding capacity, and rapid heat dissipation. The FX400 ceramic paddle design creates a quick and rapid engagement as well as clutch chatter that may not be ideal for street driven vehicles. *WARNING*: Due to the solid (no Marcel) friction rivet design, the FX400 disc engages very quickly and may chatter slightly in first and reverse. To help alleviate this problem, we only use premium ceramic friction material. The versatile FX500 System uses either the Power Plus I or Power Plus II Pressure Plate along with a solid center 4,6 or 8* wing (paddle) Ceramic Button disc. The FX500 disc is designed for outstanding holding capacity and rapid heat dissipation. The FX500 ceramic paddle design creates a quick and rapid engagement as well as clutch chatter that is not recommended for the street.